At what point does an on-site customer lose their relevance? New Relic teams rotate “PS hero” duty. Incorporate it into planning. While on hero duty, the hero’s primary responsibility is to resolve PS work that is escalated. Dev teams need to see PS problems and deal with them in order to learn more about their product, their customers, etc. Would like to see academia teach team skills and TDD. Curriculums provide a major impediment to seeing this widely adopted in college/university. So you’re a shy introvert who needs to learn to listen. Try staring at their shoes. How does self education fit into job prep? How are sites like coursera, Kahn academy, etc changing education? Most importantly, when you interact with people, you are training them on how to treat you. If you are responsive to interruption, you are training people to interrupt you. Pomodoro Technique (http://en.wikipedia.org/wiki/Pomodoro_Technique) can be used to set boundries. Teach people to look at the timer and come back when you are done. Pairing can be used to focus people and scare off interrupters, especially if you pair with someone who intimidates people. What have you put on the wall that improved work? Rumor Control Board. The work environment was suffering from too many rumors. The Rumor Control Board was for posting rumors and official information and responses to them. A very significant benefit was that placing a rumor on the RCB labeled it as a “rumor” and lead people to take it less seriously. Big Visible displays have a half-life. After a while, they lose their effectiveness or relevance and need to be reconsidered, less they become waste. 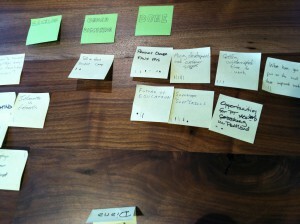 Some participants had seen an anti-product owner bias from developers at Agile Open Northwest. At Product Camp, they saw an anti-developer bias. “Well, we just have to fix the engineers.” Perhaps we shouldn’t solve our problems by getting someone else to change. 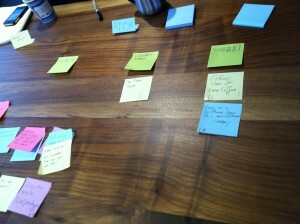 Talked about using Lean Coffee in other industries, which lead to talk about agile in other industries. Dan has shared LC with his sister, who works in aviation. But she has yet to apply it. Group talked about communicate gaps with stakeholders and sponsors. Most often, about unrealistic expectations that software be simple, easy and quick. Some stories were shared about the opposite, when stakeholders expected long, complicated cycles for what was a very small task. Talked about “The Phoenix Project” by Gene Kim, Kevin Behr and George Spafford. Only one of us had read it yet. Focused conversation about aligning development and IT work with business objectives. Talked about how this requires talking about the core business. Tech folks have to face a risk of talking outside of their domain (tech). Paraphrased as “organizations will build structures that conform to the communication patterns of the organization”. Talked about aligning organizational structure and desired technical architecture. Talked about Marissa Mayer and Yahoo! Patrick shared success stories about teams with remote devs and remote clients. Main obstacles were retrospectives. Talked about using skype and shared desktops for remote pairing. Many had found that remote pairing resulted in more engaged pairs than on-site pairing. Justin realized he’s against remote work because of the low levels of collaboration he sees in on-site work. Talked about interview techniques, including “stress to applicant” and see how they perform. Rich impersonates angry, irrational customers. Companies hire to fill gaps. Seek candidates that satisfy that gap. Some candidates look for a gap between themselves and the job. Find the right thing to grow into. Do we expect senior developers to have time for github, etc? Maybe they are too busy having a life. Agreed that we’d expect senior folks to have figured out how to work forty hour weeks and go home. Suggestions for QA tools/QA in an agile environment/What could you test (automated) that you don’t yet test? Cucumber/Gherkin (http://cukes.info/) for BDD. Folks who had used it found problems scaling it. Spock (https://code.google.com/p/spock/) as alternative to Cucumber/Gherkin. Twist (http://www.thoughtworks-studios.com/twist-agile-testing), and IDE for BDD. Helps scale test suites. Found a general need to have someone represent the customer on a day-to-day basis, as most customers don’t take on daily backlog maintenance. Big backlogs need to be thrown out. The relationships for a team/project determine who can add to the backlog. With high-trust and daily attention to the backlog from the PO, anyone can modify the backlog. In low-trust, restrict write access.